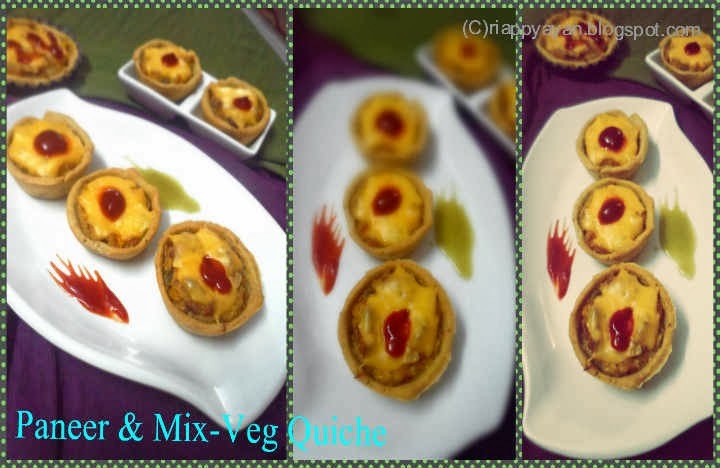 in Baked goodies, International Cuisine, Paneer, Veg. 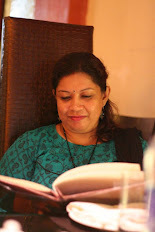 This is the 4th week of "Know Your Kolkata Food Blogger" Series and our star blogger of this week is Antara Ray, who blogs from Antypasti. She is a full-time working lady, who manages her home and her blog and she is one of the administrator of the famous foodie Group Chef At large(CAL). Even though she is a part of our KFB group, but I havn't got any opportunity to meet her personally. Hopefully we'll meet in near future. 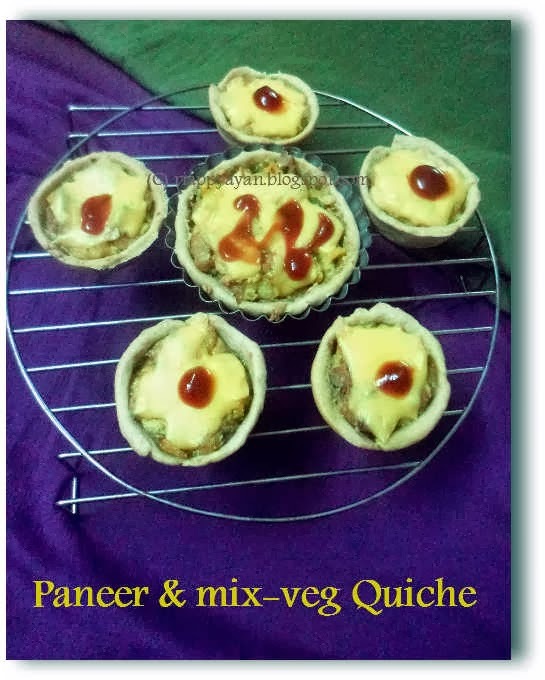 Like the name of her blog is quite interesting, she has an interesting recipe collection too. From bengali traditional food to french Quiche, she has it all. Check her blog to believe me. Prepare the pie-crust first : Take flour in a bowl, add salt, mix well. Add butter and oil in there and mix everything together until you get a crumbly texture. Add just enough chilled water to make a pilable dough. Place the dough in the refrigerator until you prepare the filling. 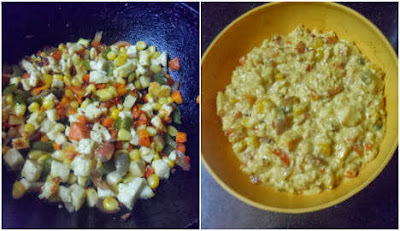 Prepare the filling : heat oil in a pan, add all the vegetables along with onion, fry till veges softens a bit, add paneer pieces, stir fry with them for a minute. Add little salt to the veges. In a seperate bowl, mix milk and beaten egg, then pour the mixture into the veges. Add cheese in there. Season with black pepper. Cook till cheese melts and the whole filling gets a creamy texture. Remove from heat, cool. Preheat your oven to 200 degree C. Grease a muffin pan or pie shells. take out the dough from refrigerator and make small ping-pong sized balls from it. Then roll out each ball into a circle to cover your muffin pans or pie shells. The rolled out dough should not be too thick nor too thin. Place the rolled out dough on each muffin cup/pie shell and Fill each muffin cup/pie shell with enough filling and bake for 25 minutes or until pie crust turns light brown. 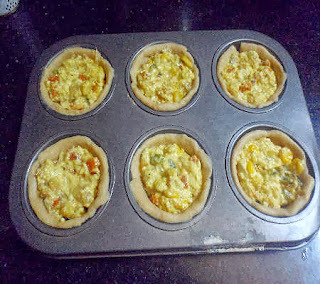 Take out and add grated cheese over each quiche and bake for another 4-5 minutes or until cheese melts on top. Cool on wire rack and serve them with ketchup or chilli sauce. Labels: Baked goodies, International Cuisine, Paneer, Veg. Very attractive mini servings, droolworthy quiche. To be healthy and fit, healthy food is also very necessary, and I agree with this post. I like reading your blog, and got many useful information's. Keep sharing.